Over the past two weeks, critics and naysayers have picked apart comedian Trevor Noah’s life since it was announced that he’d be replacing Jon Stewart as host of The Daily Show. First there were the tweets from years ago that were dug up and brought back to life. Many felt that the tweets were anti-Semitic and sexist and even called for Noah’s firing. 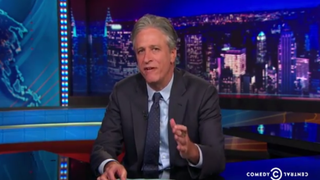 While all of this was going on, The Daily Show was actually on hiatus for the week. Although Comedy Central adamantly stood by Noah, Stewart was silent. That was until the show’s return last night. Stewart immediately joked about the Twitter “kerfuffle” and urged viewers to give Noah a chance, the same chance that he was given 16 years ago when he took over the show, and people questioned why and how an MTV guy would do politics. Stewart felt the same backlash when he took over the show, but thankfully for him, social media did not exist back then. People questioned his knowledge of politics and his ability to carry a show. But Stewart proved his naysayers wrong—just as some feel Noah will do with his own critics.